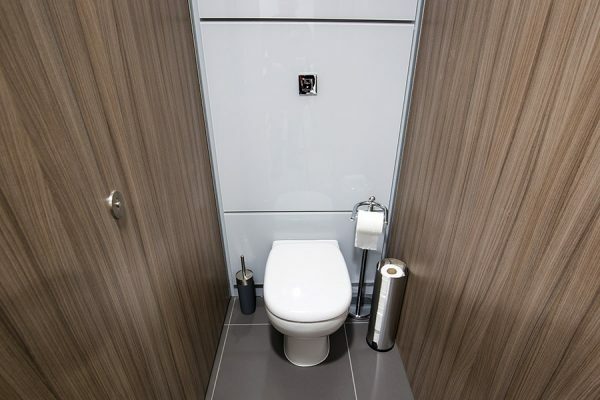 We designed, manufactured and installed new washrooms for a major international broadcaster’s new London office base. Leading international broadcaster, AMC Networks, recently consolidated three existing sites to create a new London base, which is now home to all 200 plus staff in the city. 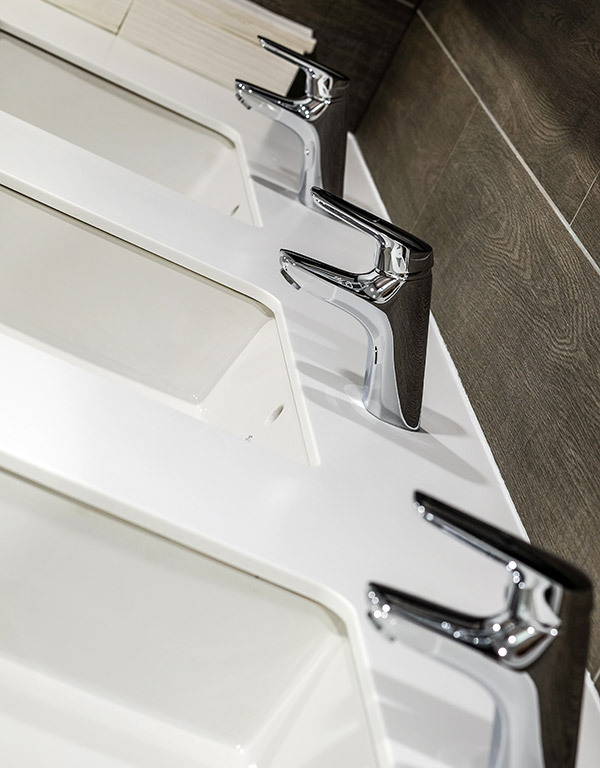 As part of the comprehensive refurb, we installed washroom facilities throughout the building. The new washroom design features our highly engineered full height Marcato toilet cubicles, faced with high pressure woodgrain laminate and finished with 20mm satin stainless pedestal feet. With a flush fascia and virtual full height doors, the Marcato cubicle provides a full height appearance without any floor or ceiling interfaces. Stainless steel cubicle locks from award-winning designer d line complete the high specification look. 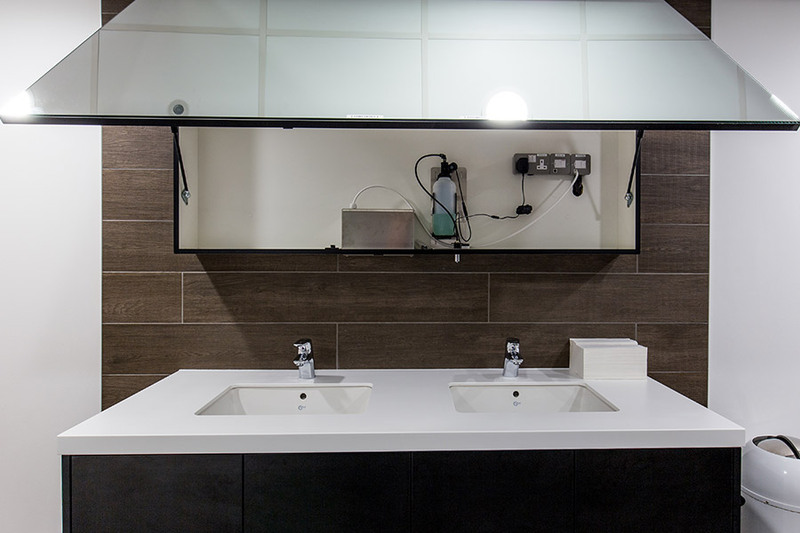 We also designed and manufactured the bespoke white Corian trough style vanity units with laminate faced under panels. 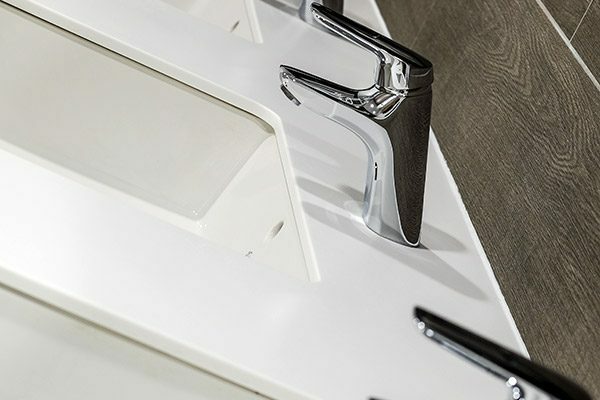 Highly durable and hygienic, Corian offers a natural stone-like appearance to provide a luxury finish which is easy to clean and maintain. Above the vanity units, we installed our new Tego hinged mirror system, which provides a compact hidden storage solution ideal for washroom consumables such as paper towels, liquid soap and cleaning agents. Manufactured with gas struts for ease of operation, the Tego system can be constructed to any size and mirrors can be sandblasted or printed with symbols to highlight details such as towels and soap so it can be tailored to suit the specific requirements of each project. Concerto integrated duct panels, faced with back-painted toughened glass, were installed behind the WCs and urinals. 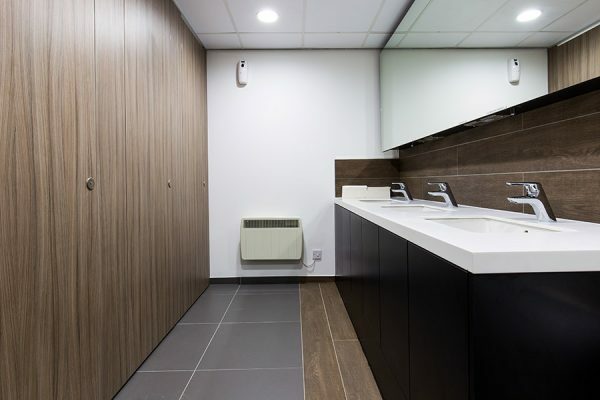 As well as hiding unsightly pipework to create an attractive finish, our duct panel system allows ease of access for future maintenance and are easy to clean.